Upon arrival in Shanghai, transfer to your hotel for a luxurious three night Special Stay. Stroll along the famous Bund and compare its heritage buildings to those in Yu Gardens. Explore the Pudong area. Admire the view from Shanghai Tower, the tallest building in Pudong. Wander through the Shanghai Museum and People’s Square before exploring the French Concession district and Xintiandi, or take an organised shopping tour of Shanghai’s markets. Alternatively, take a cruise on the Huangpu River. Later, spend your free time exploring the famous Nanjing Road. Tonight enjoy the agility and skill of the renowned Shanghai Acrobats. Travel to the ancient water city of Suzhou and cruise along the tributaries of the Grand Canal before visiting a traditional silk mill. Overnight in Suzhou. In Suzhou, known for its classical gardens, visit the Humble Administrators Garden and Masters of the Nets Garden. Travel to Hangzhou and be awed by the Impressions of West Lake. Stay for two nights. Cruise the famous West Lake before visiting Six Harmonies Pagoda, featured in the works of poets and artists alike. Learn about the Chinese cultural pillars or explore Hangzhou’s Buddhist heritage. Alternatively, explore the Xixi Wetlands by boat. Fly to Xi’an and walk the ancient city wall. Tonight enjoy the Tang Dynasty Cultural Show with dinner. Spend the next two nights in Xian. Gaze at Emperor Qin Shi Huang’s amazing Terracotta Warriors in the company of a museum curator. Enjoy a stroll around the Big Wild Goose Pagoda and Thanksgiving Temple. Be treated to a special private after hours viewing of ancient artefacts at a local museum and learn about the history of Shaanxi Province from the museum’s curator. Enjoy refreshments overlooking the Big Wild Goose Pagoda at sunset. Wander through the Muslim Quarter. 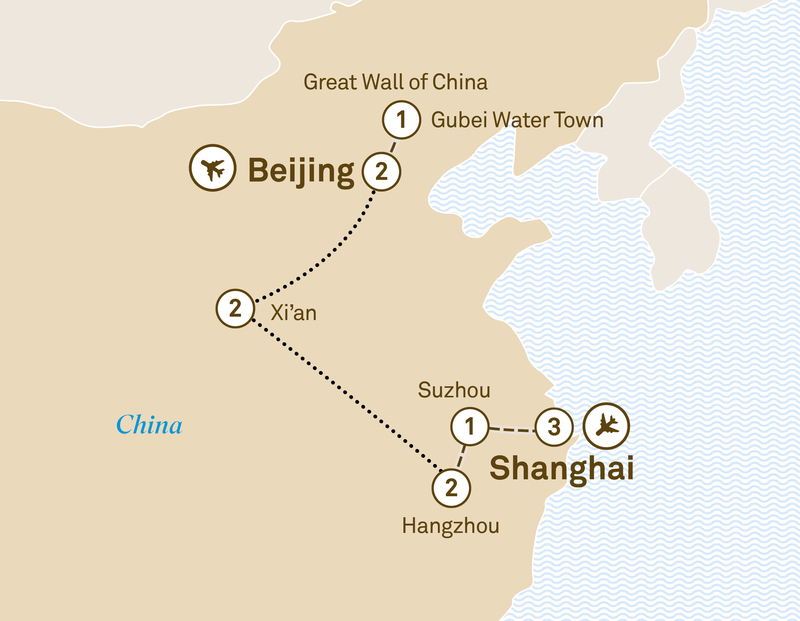 Later, fly to Beijing and enjoy two nights at your hotel, located close to the Forbidden City and many shopping malls. Wander through Tiananmen Square and enter the mysterious Forbidden City. Eat lunch with a local family in a traditional home in the hutongs before a rickshaw ride through the laneways. Look forward to the Peking Opera or the spectacular Kung Fu Show. Today visit China’s most iconic attraction – the Great Wall at Mutianyu. Continue to the new Gubei Water Town at Simatai located beneath the Great Wall and learn about ancient industries before cruising the canal through the ancient town. Spend the night at your hotel located within the town. Enjoy an enchanting evening enjoying a drink with your fellow travellers by the canal overlooking the illuminated Great Wall. Depart after lunch today and transfer to Beijing airport.